← Take the Plunge and Plant Your First Vegetable Garden! For example, what type of message do you want your business to convey? 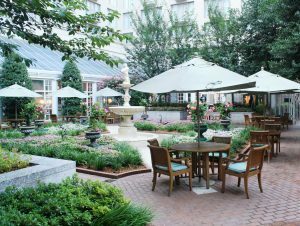 If you have a large space, you may want to incorporate fountains, seating, outdoor seating / lounge area. This will encourage people to stay and enjoy the space. This would be ideal in the hospitality industry for example. It gives off the feeling of relaxation and is very welcoming. If on the other hand, you don’t want people “lingering” around, you would then not supply seating etc. Some businesses want a more efficient flow of traffic in and out. You could also highlight entrances with trees or shrubs. So then, not only does it look good, it is also serving a purpose. The key is to not overdo it though – often times, less is more. People are attracted to a nice landscape that feels inviting. If things are not well maintained and there is nothing going on, that can actually drive business away. You want to impress your clients, not repel them. If your goal is to conserve energy and water, you can do things like shade your building in the summer and block strong winds in the winter. 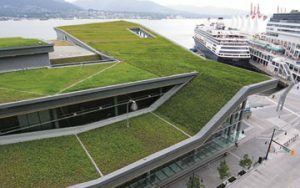 Add a green roof to help control water run-off, plus reduce cooling and heating costs. It’s also very important to have a good understanding of the maintenance required for whatever type of landscaping you choose. You don’t want to just choose a certain look and then not be able to upkeep it properly. This is why it is a great idea to hire a professional landscaping company – leave the work to the pros and focus on the meat of your business instead! 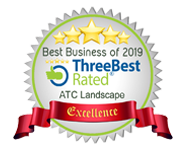 For high quality, professional, and eco-friendly landscaping in Coquitlam & area, call us at ATC Landscape. Your property will be in great hands! We can provide you with solid advice as to what will work best for your needs and then make your vision a reality. This entry was posted in Uncategorized and tagged commercial landscaping coquitlam, commercial landscaping tips, coquitlam landscaper, coquitlam landscaping. Bookmark the permalink.